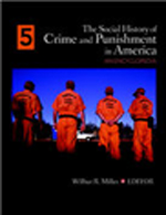 This work surveys the history and philosophy of crime, punishment, and criminal justice institutions in America from colonial times to the present. It covers the whole of the criminal justice system, from crimes, law enforcement and policing, to courts, corrections and human services. Its entries provide the historical context for students to better understand contemporary criminological debates and the contemporary shape of the U.S. system of law and justice.